The Palestinian Nakba is a catastrophe for the Jewish colonists and their descendants: it transformed the once decent surviving victims of European anti-Semitism and the Holocaust into terrorists, killers, thieves, racists, and liars – into the mirror image of their persecutors. And the same perverted brush tainted the UN and Western governments as collaborators of the sickest and most sadistic society in the world. 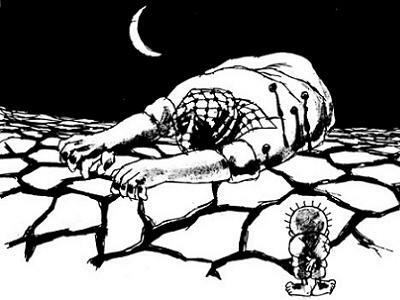 The 1947- 48 Nakba or ‘Catastrophe’ was the execution of the systematic and savage terrorism set out in Plan Dalet with the clear purpose of ethnic cleansing Palestine of indigenous Palestinians in the Zionist quest for Lebensraum. This land expansionism extends from the Nile to the Euphrates Rivers for the benefit of Yahweh’s chosen racists (Genesis 15:18). In reality, it is a Zionist imperial policy of racial restructuring of the Middle East (supplanting Arabs with Europeans) beginning with a Jewish state of Israel. Today is Nakba Day, as was yesterday and all days back to the 1922 British Mandate with its broken legal obligations to hold Palestine in trust until independence. Daily, the Zionist war crimes of illegal demolitions, evictions and squatting in Palestinian homes occur. The imposed torture of fear, stress and loss the Palestinian families is unimaginably cruel. On May 4, 2015, the Zionist court ordered the removal of the Bedouin village of Susiya in southern Al Khalil. On May 5, 2015, the village of al-Araqib that has been razed 83 times on its traditional Bedouin land was ordered to pay $500,000 to cover the cost of the demolitions! The degradation of mind that inflicts such abhorrent extortion on victims hasn’t existed since the Third Reich. In 2014 alone, in the West Bank, 493 Palestinian facilities were demolished in acts of state terrorism and there are 11,000 demolition orders pending. Such orders are reminiscent of the Nazi ‘Property Confiscation Order’ which goes a long way to explain the arrogant mindset of Zionists indecently living in the confiscated homes and lands of the now 7.2 million Palestinians denied their inalienable Right of Return by successive Zionist governments. Meanwhile aliyah– immigration to Israel, is accorded to all Jews mainly attracting rabid radicalized messianic bigots from the USA who are housed in the illegal parasitic colonies that leech the land and livelihoods of the ethnic Palestinians. These colonial terrorists constitute the vanguard of the 400,000 illegal armed settler militias that, with 100% state impunity, threaten farmers, uproot olive trees and orchards, close farmland to Palestinian owners, level Palestinian agricultural lands, consume two thirds of Palestinian water, dump solid waste next to Palestinian villages, throw their faeces and urine on Palestinians, vandalize cemeteries, mosques and churches, torch cars, steal artefacts from historic and archeological sites, damage water and electricity infrastructure, purposely hit-and-run Palestinians including children, harass schoolchildren, physically assault and kill. In a decent society, the deranged perpetrators of this endemic criminality would be locked up in mental institutions. Zionist children are warped and twisted by psychological child abuse from birth – they are ingrained with a victim mentality from the perpetual fear of a future holocaust. This learned paranoia is overlaid with a national superiority and Arabhass (hate) which foments hostility and aggression perfect for their military destiny as killing machines- inhuman robots in which the civilizing forces of compassion and respect for the Other are castrated. Mandatory conscription, bar few exceptions, means that every citizen is a soldier supplying Israel with an eternal army of blasé child-killers and abusers. The children of the Israelites, outfitted in tactical assault gear, can casually shoot a teenager, truss him and let him bleed to death; they directly targeted children in drone strikes; they can fire shells that slaughter instantly four little boys playing football on the beach; they cooly load shells of illegal white phosphorous that inflict vicious burns on the tender bodies of Gazan children; they conduct gestapo night raids tearing terrified Palestinian children out of beds for throwing stones against armored jeeps; they routinely torture Palestinian children in detention; they ensure no Palestinian child is safe. Not only is Israel a military society with a normalization of atrocities and barbaric cruelty, it is a military economy. It’s revenues are boosted by testing its high-tech weaponry on living innocent subjects in a locked laboratory called Gaza where the Zionists control land and sea borders. The world was shocked by Nazi experiments on human beings, but Palestinian families, dead, maimed, traumatized, and hundreds of thousands homeless by pulverizing bombardments, boost Israeli profits from sales to keen western and eastern governments. Lies lies lies ad nauseum that decent people no longer fall for. In the new Netanyahu coalition government of Likud and Jewish Home (JH), the masks have been ditched for outright racism, warmongering and a Jewish state sans frontières and sans Palestinians. On March 16, 2015 Netanyahu pronounced, “If I’m elected, there will be no Palestinian state”; Naftali Bennet head of the far-right settler party, JH, now Education minister has rejected a Palestinian state. Eli Ben-Dahan, JH, is now responsible for administering Palestinians whom he denounced as, “beasts, they are not human.” and the Justice Minister, Ayelet Shaked, JH, called for the genocide of Palestinians. JH MK Yinon Magal said advancing two states is treason. Last year the Knesset’s deputy speaker, Moshe Feiglin, in the midst of Gaza’s devastation, called for the total extermination of all Palestinians in Gaza affiliated with Hamas and the forcible transfer of remaining refugees to concentration camps in Egypt. Consequently, Zionists are doomed not to live in a promised land, but doomed to exile in a wasteland of moral stagnation. And like all the invaders of ancient Palestine, they too will pass.